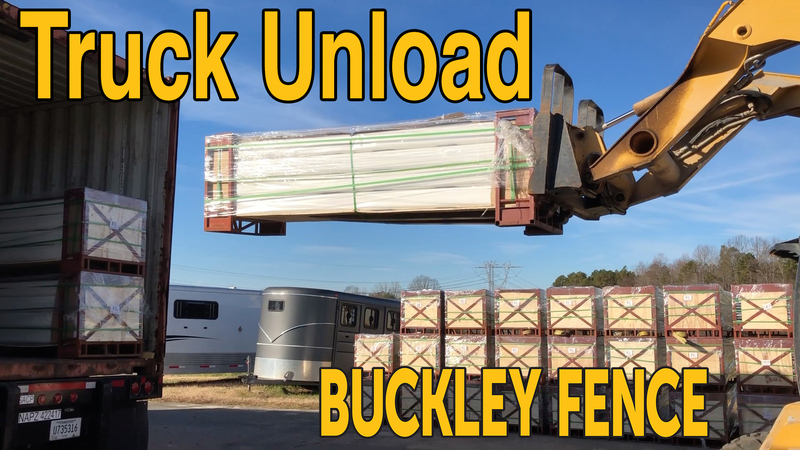 Horse Fence, Steel Board Horse Fencing & More From Buckley Fence LLC. 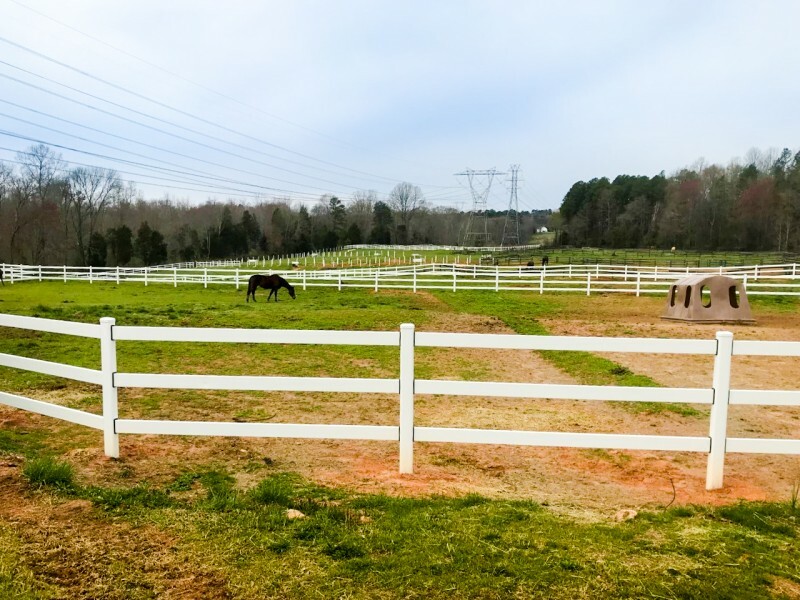 See why Laura and Kari love their Buckley Steel Board Fences. Our Steel Board Fencing has the aesthetic appeal of traditional wood fencing but is much stronger and more durable. The steel is two-sided zinc galvanized and powder coated with architectural grade powder coating in combination with a zinc phosphate conversion coating for superior paint adhesion and rust protection. The powder coat finish is durable, water resistant, impact resistant and UV resistant. No painting required, except minor touch-up spray paint. No warped, broken or sagging rails. No rotting posts. 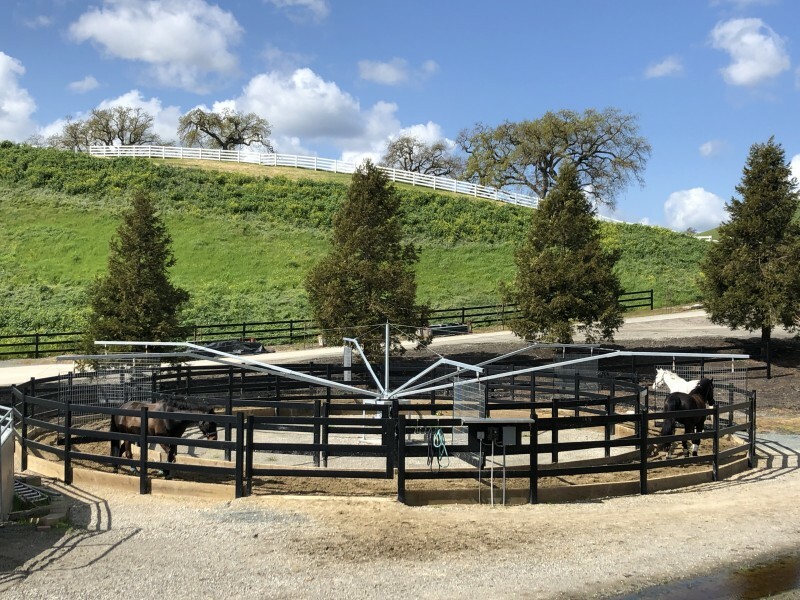 The dimensions and geometry of the steel posts and rails give them considerable strength and flex (or “give”) to protect the horse upon impact. Properly treated to resist corrosion, the galvanized powder coated steel will last 25 plus years and easily more depending on environmental conditions. The steel posts have rail openings lined with patented rubber grommets to protect the steel rails. Inside each steel post is a patented lock spacer that holds the rails in place, eliminating the need for nails, screws or fasteners. The steel rails are easily articulated within the post opening allowing the fence line to follow the terrain of the land. Installation is simple for the installer or the do-it-yourselfer. The highly visible posts and rails have smooth, rounded edges and no fasteners or nails. While the steel gives the fence tremendous strength, the long rails and rubber grommets enable the rails to flex and not break. The horse will be cushioned upon impact and not injured. Steel is a very sustainable exterior material and is one of the most commonly recycled materials. 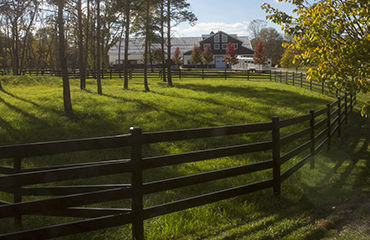 The Steel Board Fence is made primarily of recycled steel and is 100% recyclable. The powder coat finish is non-toxic, free of volatile organic compounds or chemical-based solvents. The gate rests on top of the separate gate post on a built-in dual bearing system inside the post-end of the gate. The gate post engages the upper bearing assembly inside the gate which allows the gate to open and close easily and quietly. After the gate is placed on the gate post and engages the upper internal bearing, the gate is leveled by rotating the lower bearing. 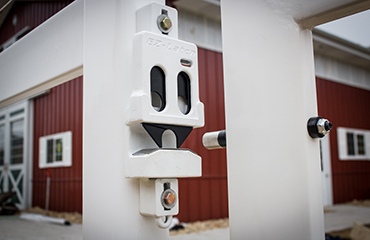 When the gate is level, the bearing lock screw is tightened and the gate is kept perfectly level at all times. 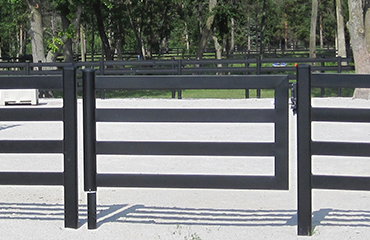 Two-way operation makes it easy to open and throw the gate closed from either direction while on your horse. Latch pin rests on the latch plate when the gate is closed, alleviating the weight on the gate post..
Made of corrosion resistant aluminum alloy with galvanized steel inserts. Horizontal and vertical adjustments can be made anytime during or after installation.